Characeae, a family of calcifying green algae, are common in carbonate-rich freshwaters. The southwestern shoreline of Lake Ganau (Kurdistan Region, northeastern Iraq) harbors dense and thick mats of these algae (genus Chara). On the lake bottom and along the shore, carbonate sands and rocks rich in the remains of stems, branches, nodes, and whorls of Chara are deposited. These deposits show all stages of growth and degradation of characean algae, including replacement and lithification into limestone. The replacement of the fragments by fine-grained calcite preserved delicate microstructures of Chara, such as cortical walls, cell shape, inner and outer layers of the stems, and reproductive organs. Based on roundness, sorting, the degree of lithification, and preserved microstructures of the grains (fragments), three facies were recognized. The first is represented by a newly formed lime sand facies showing elongated grains, poor sorting, and reduced roundness, with pristine preservation of characean surface microstructures. The second is a weathered lime sand facies, which shows better sorting and good roundness, whereas internal structures of characean fragments are still well preserved. The third is comprised of a lithified lime sand facies (grainstone), with very well sorted and rounded grains, and poorly preserved external and internal structures of the characeans. As compared to the newly formed lime sand facies, the grainstone facies shows an increase in grain size by more than 30 %, owing to precipitation of micritic lamina of possible microbial origin. Eventually, the Characeae-derived lime sands are lithified into oolitic limestones with sparry calcite cement, forming a grainstone microfacies. The present study has important implications for the interpretation of pre-Quaternary environments, as it records all stages of the fossilization process of characean green algae and highlights the role of these algae in the formation of oolitic carbonate rocks. Charophytes are a group of carbonate-precipitating, macroscopic green algae that forms an important floral element in the littoral zones of carbonate-rich freshwater or brackish lakes up to ~12 m deep (Tucker and Wright 1990; Platt and Wright 1991; Garcia 1994; Garcia and Chivas 2006; Détriché et al. 2008). Their stems may reach 2 m in length and consist of elongated cortical cells twisted around a long central cell (Brasier 1980; Ghazala et al. 2004). The stems contain whorled branches along their lengths that can be calcified through extra-cellular coating (Anadón et al. 2000). Therefore, these algae fossilize easily through the biomineralization of the protective covering of the reproductive organs and stems by calcium carbonate (Martin-Closas and Dieguez 1998; Anadón et al. 2000). Charophytes include the extant family Characeae, with the most common genus being Chara, and several extinct fossil families. Fossil remains of charophytes first appeared in calcareous shales of Late Silurian age (Martin-Closas 2003). Since then, the group has undergone diverse morphological changes, and their evolutionary record experienced multiple extinctions and originations. Hence, charophytes represent a reliable group of fossils in biostratigraphy and, due to their specific habitat requirements, in paleoecological reconstructions (Garcia and Chivas 2006). It is suggested that in the absence of other appropriate fossil records, extensive use of charophytes should be made in studies of continental and marginal marine sediments (Kumar and Oliver 1984). For instance, Climent-Domènech et al. (2009) reported thalli (stems and nodes) and reproduction organs of the genus Clavatoraxis in the Barremian of the Maestrat Basin (Eastern Iberian Chain), and developed a paleoecological model of this non-marine environment based on charophyte remains. Charophyte remains typically consist of vegetative (thallus) fragments and gyrogonites (calcified fructifications), which reliably reflect the nature and quality of the water in which the plants grew (Soulié-Märsche 1991). Photosynthetic activity of charophytes leads to precipitation of autochthonous carbonates that may substantially contribute to lacustrine sedimentation (Apolinarska et al. 2011). Soulié-Märsche et al. (2010) reported on lake carbonates (“characeite”) from the Middle Atlas Mountains, Morocco, which consist of up to 93 % of Characeae fragments. In shallow waters, dense Characeae meadows restrict sediment re-suspension, which consequently reduces the recycling of nutrients to planktonic algae. Moreover, Characeae decompose slower than their vascular counterparts, and the prolonged nutrient storage in their biomass may provide an efficient “nutrient trap” in shallow lakes (Kufel and Kufel 2002). 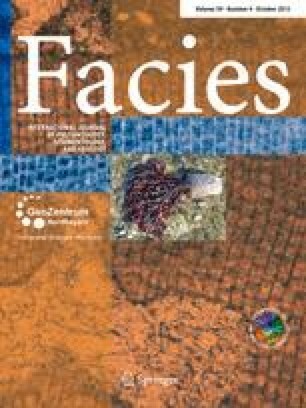 The present study reports on the occurrence, preservation, diagenesis, and characteristics of different characean fragments in sediments and beach rocks of a Recent, slightly acidic and sulfidic freshwater lake in the Western Zagros Mountain Belt (Kurdistan Region, northeastern Iraq; Fig. 1). To our knowledge, this study is the first that records all stages of the transformation of the Chara skeleton from the living form into components of cross-bedded carbonate rocks, through dispersion in loose sediments. The role of microbes in the transformation of algal fragments to coated grains (ooids or oncoids) is also discussed. An improved knowledge on the fossilization process of Chara components (as intraclasts) in (sub-)Recent sediments is valuable for distinguishing these parts in the geological record and thus for the interpretation of ancient non-marine environments. Lake Ganau is located 10 km southeast of the town of Ranyia, Sulaimani Governorate, NE Iraq (co-ordinates: 35°51′12″N; 44°45′49″E). It is approximately 350 m in diameter and approximately 20 m deep at its center (Fig. 1). The lake is situated approximately 15 km to the south of the main suture zone of the western Zagros Fold-Thrust Belt that passes through northeastern Iraq close to the border with Iran (Buday 1980; Jassim and Goff 2006). The area mainly consists of high-amplitude anticlines and synclines with the same strike direction (NW–SE) as the Zagros Mountain Belt. Many of the anticlines are asymmetrical, with the southwestern limbs steeper than the northeastern ones. The recharge area of Lake Ganau consists of partly bitumen-rich Jurassic and Early Cretaceous formations (Bellen et al. 1959) that are located at high and low elevations, respectively. The Jurassic is represented by the Sarmord (marlstone) and Qamchuqa (limestones and dolomites) formations, while the Early Cretaceous includes the Sargelo, Barsarine, and Naokalekan Formations (Fig. 1b). Lake Ganau is located on the axis of the Ranyia Anticline, which is eroded and now exists as a large valley (Ranyia Valley). Along the sub-surface groundwater path, significant amounts of carbonate rocks are dissolved, which supersaturates the discharging spring water with Ca(HCO3)2 (Manmi 2008). The lake originated from chemical erosion (karst) of underlying Jurassic carbonates (Fig. 1d). A normal fault localizes the emergence of the spring in the present position. The spring has an overflow of approximately 12 l/s, discharging through a small channel into Dokan Lake (upstream of the Little Zab River, Fig. 1b). A central circular spring mouth (Fig. 1d) supplies Lake Ganau with oxygen-depleted, slightly acidic and sulfidic groundwater. The water is used for irrigation and livestock. Maximum and minimum temperatures and other water parameters are given in Table 1. On the southwestern side, near the shore of the lake, Chara form thick and dense mats with highly intertwined branches and roots. Their stems extend from the bottom of the lake as high as 150 cm into the water column. Black organic matter, mixed with lime sand, can be observed on the sandy bottom of the lake below the mats. The surface-exposed rocks along the shore of Lake Ganau contain large oncoids (up to 15 cm in diameter) that show clear concentric lamination (Fig. 2). These oncoids have been interpreted as microbial in origin and formed by a process similar to that leading to the formation of stromatolite laminae (Karim et al. 2010). Characeae are not found along the southern and eastern shores of the lake, which are instead occupied by reed (Phragmites). Fifteen samples were taken from the unconsolidated lime sand and its limestone counterpart on the southwestern shore. Sand samples were prepared by embedding them in transparent epoxy. From both types of samples, thin-sections were prepared and characean fragments were identified under the microscope. A stereomicroscope was used in the field and in the lab for studying and comparing the living parts of the Characeae and their calcified bioclast counterparts (Fig. 3). Cross and longitudinal sections were made, and the dimensions of the bioclasts were measured under the microscope. The temperature and pH of the lake water were monitored during 1 year at the western and eastern shoreline. To determine the mineralogy of the lime sand, samples were taken from different locations at the southwestern shoreline along a transect starting from a water depth of 2 m towards the onshore area (Fig. 1d). The samples were pulverized and tablets were prepared for XRD (X-ray diffraction) analysis. For the same purpose, approximately 7 l of lake water (taken during whiting events) was evaporated in an oven at 56 °C. Approximately 2 g of dry lime mud residue were obtained and analyzed by XRD. Two factors determine the precipitation of CaCO3 in Lake Ganau. First, depressurization of carbonate-laden groundwater leads to a release of excessive CO2 and stimulates precipitation of CaCO3. Moreover, the consumption of CO2 via photosynthetic activity of cyanobacteria, algae, and higher plants further supports the mineralization and precipitation of CaCO3 (Merz 1992; Riding 2000). It can thus be anticipated that both the supersaturation of the incoming lake water with CaCO3 (Manmi 2008) and the presence of characean algae exert a major control on the effective production of CaCO3 in Lake Ganau. As a result of the combined effects, whiting events occur during the summer, particularly during times of strong winds (Fig. 4). Freytet and Verrecchia (2002) attributed lacustrine whiting events to seasonal diatom and cyanobacteria blooms, and likewise Thompson et al. (1997) and Hodell et al. (1998) emphasized a biogenic control on whiting events due to the photosynthetic activity of cyanobacterial picoplankton. The latter authors stated that calcite is formed in the microenvironment surrounding Synechococcus cells due to a photosynthetically driven alkalization process and the availability of the cells as nucleation sites. Our XRD analyses show that the precipitated particles consist mainly of calcite whereas the surface sediment also contains a considerable portion of aragonite (Fig. 5). The occurrence of aragonite in the sediments is most likely due to early diagenetic crystallization. It is also possible that the arid climate promotes the abiogenic, diagenetic formation of aragonite on the shore, analogous to the western coast of the Arabian Gulf, where aragonite precipitation is common (Scholle and Kinsman 1974). In living Characeae, direct calcification involves only the reproductive organs (Flügel 2004). However, in the Lake Ganau sediments, all calcified parts, including stems, branches, nodes, leaves, and reproductive organs were identified (Fig. 6). Similarly, Climent-Domènech, et al. (2009) reported stem parts of the genus Clavatoraxis from the Barremian of the Maestrat Basin (Eastern Iberian Chain). However, the characteristics of the genus Clavatoraxis are different from those of Chara described in the present study and its fossil parts (fragments) were less well preserved. A study that is more directly comparable to the present one reported on characean remains from Holocene lake shore terraces of Lake Afourgagh (Middle Atlas Mountains, Morocco; Détriché et al. 2009). The authors proposed biogenic activity as a dominant control on the accumulation of the lake sediments, including thick tufa deposits composed of Characeae-encrusted stems with numerous gyrogonites (termed “charophyte tufas”). In Lake Ganau, the Chara framework soon becomes brittle after death of the algae, and is easily fragmented by wave action induced by a steady-blowing northeasterly local wind called “Rasha Baa” (Black Wind). Subsequently, CaCO3 precipitation around the characean fragments begins and the internal structures are replaced by sparry calcite or micrite during diagenesis. Whereas most grains derive from characean fragments (Fig. 6), the lime sand also contains some small ostracods and very rare dwarf gastropod shells. The resulting lime sand at the southwestern shoreline of Lake Ganau (Fig. 7) has accumulated to a thickness of approximately one meter. The fragments are transformed to coated grains (ooids and oncoids). Karim et al. (2010) studied the microstructure of different-sized oncoids, approximately 2 mm to 15 cm in diameter, in Lake Ganau, and described them as globular stromatolites whose formation was likely mediated by the activity of cyanobacteria. It is likely that these microorganisms also play a role in accelerating the diagenetic replacement of characean bioclasts by CaCO3 and development of ooid laminae. An association of microbially mediated oolites and stromatolites is also known from Lower Triassic non-marine rocks around the Harz Mountains (Germany), i.e., the classical type locality of stromatolites (Kalkowsky 1908). There, oolites and stromatolites may be regarded as end members of a continuum, representing a trend in which the accreting layers show a decreasing influence of a central nucleus in determining the growth form (Kalkowsky 1908; Paul et al. 2008). Like in Lake Ganau, in the Barremian of the Maestrat Basin (Eastern Iberian Chain), Climent-Domènech et al. (2009) found Characeae (genus Clavatoraxis) fragments associated with a high proportion of calcified green algae and cyanobacterial filaments. Such involvement of freshwater bacteria in the precipitation of carbonate crystals and subsequent lithification has been discussed in detail by Zamarren et al. (2009). Based on roundness, sorting, degree of lithification, and preserved microstructures of the grains, three facies were distinguished, as described in the following. The sediments of the newly formed lime sand facies exhibit very poor sorting and little rounding (Fig. 8a). Most grains comprise fragments of characean elements (with comparatively few gyrogonites), which have an elongated or rod-like shape. The color of most of the clasts is milky, while others are black or grey (Fig. 8a). According to the observation of black organic matter on the lake bottom below the Chara mats, the black color may originate from an incorporation of organic matter during calcification. It is likely that the supersaturation of the lake water with respect to CaCO3 and the presence and activity of cyanobacteria play an important role in the replacement of Chara fragments with calcite. The surface of the fragments (grains) shows a delicate microstructure (or texture) of grainy appearance (verrucate) and longitudinal depressions (fossulate). The verrucate texture is formed by enlargement of the calcified stem cortex cells during growth of, and displacement by, calcite crystals (Fig. 8b). This facies is mainly observed in the low-energy areas within the 1- or 2-m-wide strip of shallow water between the living characean mats and the actual shoreline. The dense and thick mat temporarily prevents the sediment of this facies from being eroded and transported to deeper parts of the lake. The weathered lime sand facies is characterized by well-sorted and rounded grains with smooth surfaces (Fig. 8b). Most grains have moderate roundness and fusiform shapes that reflect the original elongate nature of the skeletal fragments of Chara. Grains originating from stem fragments display an elongate and rounded shape with circular cross section, 0.3–0.9 mm in diameter, and show clear traces of cortical cells filled by CaCO3. Grains mainly consist of calcite, and to a lesser amount of aragonite (Fig. 5a). This facies may be comparable to the aforementioned “characeite” described by Soulié-Märsche et al. (2010) from Morocco. The most easily distinguished characean elements are wall cortical cells and the central cavity (compare Figs. 6, 9). Clasts derived from the whorls, from which six branches once extended, can also be recognized. In thin-section, however, less than six branches can typically be observed, depending on the direction of the section, which in most cases is oblique to the whorl axis (Fig. 9a). The thickness of the grains (clasts) of the weathered lime sand facies is more than 30 % greater than that of their counterparts in the living algae. The additional thickness is due to post-mortem precipitation of very thin micrite laminae around the clasts. Thus, the clasts served as nuclei for the microbial and physical precipitation of calcite laminae, and finally developed into coated grains (micro-oncoids or ooids; Gunatilaka 1977). The development may be further promoted by local wind agitation and by the particular hydrochemistry (carbonate supersaturation, Table 1). Fragmentation of the bioclasts during transformation to ooids commonly occurs. It is also worth mentioning that a mixture of both the newly formed lime sand facies and the weathered lime sands facies, may occur in the same sample (Fig. 8b) due to wave reworking that eventually results in the final deposition as a sand bar along the beach (Fig. 1d). The sediment of the weathered lime sand facies is eventually transformed into hard oolitic limestone. These rocks make up a lake shore terrace that borders the lake and has been partly eroded due to recent wave action (Fig. 4b). The exposed thickness is approximately 1 m but the true thickness is probably greater as the measured sequence is partly covered. The deposits are characterized by parallel and cross-stratification and show an oolitic grainstone microfacies. As with the other two facies, most nuclei of the ooids are characean bioclasts whose cortical cells and central cavities are more or less obscured due to re-crystallization (Fig. 10a, b). The cement is calcite, which occurs either as patches of blocky calcite or as a relatively thin rim of equal crystals around the oolites and oncolites (Fig. 10b). According to Flügel (2004), this latter type of cement can be classified as a product of a meteoric-phreatic environment. Notably, cemented ooids within this facies may be overgrown by stromatolitic laminae (Fig. 11). A similar association of charophytes with stromatolite structures, including the enlargement of characean bioclasts through biogenic laminae was mentioned by Martin-Closas (1999) from Lower Cretaceous lacustrine deposits of Las Hoyas (Iberian Ranges, Cuenca, Spain). The duration of the lithification process is not known for the Lake Ganau sediments, but a recently cited example of sub-aerially exposed Holocene oolitic sand on Eleuthera Island, Bahamas, was completely case-hardened by freshwater vadose calcite cementation (Dravis 1996). Although the environmental conditions and characteristics of the sediments from the Bahamas differ from those of Lake Ganau, it can be anticipated that lithification of the oolitic Characeae sediments may be completed within tens of years. Lake Ganau, a small carbonate-rich freshwater lake in NE Iraq, acts as an effective lime sand factory driven by the vital activity of calcifying characean green algae (genus Chara). Wave action resulting from northeasterly winds assists in the breakdown and sorting of algal skeletons into small fragments (grains) that cover the lake bottom at shallow water depths along the southwestern shore of the lake. The resulting lime sands are characterized by the diagenetic replacement of characean fragments. Moreover, all the grains (bioclasts) are converted to ooids by deposition of concentric micritic laminae, thus leading to thickening of grains and the formation of superficial ooids and micro-oncoids. The lime sands can be classified into three facies that are characterized by increasing sorting, rounding, lithification, and relative age, i.e., diagenetic overprint. The produced sediments are finally transformed into oolitic limestone by lithification forming a grainstone microfacies. This study is the first to record the transformation of all parts of characean algae into loose sediments and, eventually, into laminated carbonate rocks. Lake Ganau thus provides an excellent insight into the occurrence and fossilization process of characean algae and the formation of Characeae-derived carbonates. It may also be considered as a modern reference for the interpretation of ancient freshwater environments. We are grateful to E. Gierlowski-Kordesch, E. Samankassou, and an anonymous reviewer whose thoughtful comments greatly helped to improve the original manuscript. This research was funded by the German Academic Exchange Service (DAAD; grant no. 50725110).